I was invited to attend the Grand Opening Ceremony of Entopia by Penang Butterfly Farm this morning, and I was not sure what to expect. When thinking about what I would wear, my butterfly dress was an obvious choice. The outdoor tent where the Grand Opening Ceremony was hosted was perfectly elegant--decorated in turquoise and white, the colors of Entopia. There were even chandeliers hanging from the ceiling! The lion dance started off the ceremony, and I was delighted by these 'customized' lion dance costumes, color-coordinated with the rest of the decor and branded with the Entopia name. Entopia is a re-imagination of the Penang Butterfly Farm, which opened about 30 years ago. During the ceremony, they played a nostalgic slideshow of photos from the Penang Butterfly Farm that used to be. I will admit that I actually teared up looking at the old photos--I visited the butterfly farm probably four or more times during my teen years and all the images were very familiar. The Penang Butterfly Farm was where we took Angel on his first day in Malaysia! After the dance and song performances, and the heartfelt speeches, the ribbon was cut and we were allowed to go on an official tour of the new facilities. Hurray! All I can say is, WOW! Entopia is much, much larger that the Penang Butterfly Farm that was (the expansion brought the park from 30k sq. feet. to 100k sq. feet), and is completely re-imagined and updated for a whole new generation of bug-lovers. It's easy to tell that a lot of thought, care, and creativity were put into the design of the park. Natureland, where butterflies roam free, houses about 50,000 butterflies. Butterflies are still the star of the show at Entopia, but there are plenty of other cool critters to check out. Dragonflies get their own special dome. Natureland is an enclosed, greenhouse-like space. This region is known for it's brutally hot days, but misting inside Natureland kept the climate feeling quite comfortable. You can even eat inside the butterfly habitat (or in the actual restaurant, if you prefer), when you order a meal from Tapestree. Once leaving Natureland, you head into the darker and cooler Cocoon. The Cocoon is a place for many educational exhibits--but don't worry, there's still quite a few more live insects to check out once you get inside! You can read information all about a butterfly life cycle and the kinds of foods different animals eat. One region that I thought was really fun was Downtown Entopia, which is styled as if the bugs themselves built a town! There's cafes with bug-appropriate menus, a toy store and a library, and even a bridal studio where the latest in bug-and-plant-inspired bridal couture is modeled! There was an 'Antique Shop' of sorts, in which you could read about a lot of the old beliefs that surrounded different types of insects in years past. I loved reading this story about maggots, because it's one tale I learned back in elementary school--and one with a lesson--scientists are sometimes completely and utterly wrong. Like when they think that maggots are created from rotten meat. Would you sit on this bench? I spent an incredible morning at Entopia, and after I had finished touring the facilities, I was able to eat a delicious catered lunch. The heart-warming opening ceremony, the high-quality park, and the delicious lunch provided for the media and special guests all worked together to create an amazing opening day experience for all involved. 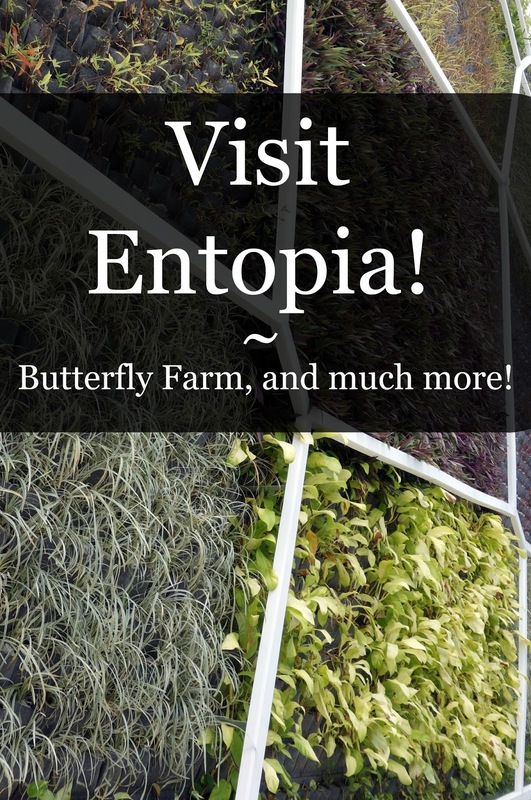 I highly recommend visiting Entopia whenever you're in the area! I think this is going to be a brand new hotspot for visitors to Penang from all around the world. They included a sampling of their merchandise in the bags they gave to all who attended the event, and I love the design and colors of this mug! And you can bet those tiny bookmarks are going right into my current reads. Thanks, Entopia, for inviting me to share in your Grand Opening Event! I know that this park is already an incredible addition to lists of fun things to do here, and I'm already thinking about when I'll go back! Regular entrance fee is 49RM for adults and 29RM for children and seniors, but there are discounts available if you buy your tickets online or if you visit during their opening celebration up until the 31st of July. Have you ever visited a butterfly park of this sort? How do you feel about insects? Wow, what a beautiful place! What are you doing while you're in Malaysia, or are you just traveling through? I love your dress choice. This looks awesome! I'm glad you had such a great day. The photos look amazing and probably don't even do this place justice! What a fun experience! It looks like such a beautiful place to check out! This is so fun! We would have gone when we were there if it had been open. We have a tiny butterfly farm in Kansas during the summer. We just took my nephew there and he stomped on a butterfly and then we had to leave. =( It was terrible but also funny. He got in big trouble. Anyways, I'm glad you got to go. That is really neat. OMG this looks so lovely and fun!!!! The monarchs used to fly through Austin every year when I was growing up - for weeks we'd have thousands of butterflies in our front yard. It was so lovely. How cool! This looks like such a fun day! Your outfit is beautiful! So cool that it matched with the event going on. This looked like so much fun... I don't know if I'd sit on THAT bench, but I'd have fun looking at it... from a safe and far distance. I like bugs... just when they aren't with a billion legs and crawling all over me. Butterflies were always so pretty. We are hatching some in our class this summer. Should be fun! I've always wanted to go to one of these! That is so beautiful! And I like your butterfly outfit. I could probably not sit on the bench. Millipedes freak me out O.o. This is so pretty. I love the vibrant colors of the last butterfly. And your dress is on point! ha! How cool is that!? I love butterflies so I bet I would enjoy this! What an interesting place! I'd love seeing the butterflies, but I'm not so sure about the rest. I can tell you for sure that I wouldn't sit on that bench, haha! That looks like an awesome place to visit! Love those tiny bookmarks, too! So fun! I'm loving all the beautiful pictures! I visited a butterfly park in Georgia but it was a long time ago and I don't remember much about it. I'd love to go back sometime though.